Deriving its name from its distinctive melodious call, the huia Heteralocha acutirostris was a member of a small family of birds found only in New Zealand and referred to as wattlebirds. A crow-sized species whose glossy black plumage disclosed a deep green sheen when viewed at certain angles in sunlight, it was instantly characterized by its pair of bright orange facial wattles, its elegant tail plumes with broad tips decorated by a wide band of sparkling white (tinged with rufous in young birds), and – above all else – by the truly exceptional, extraordinary nature of its ivory-coloured beak, for unlike virtually all other birds (see below) the huia had not one beak but two. 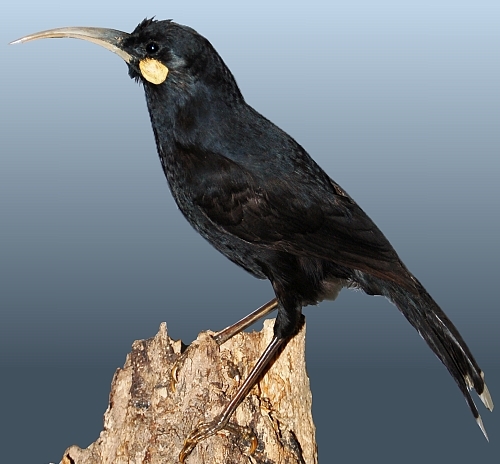 This is not as surprising as it might otherwise seem, because whereas the male huia’s beak was short and straight, used for chiselling out grubs (especially those of Prionoplus reticularis, a longhorn beetle commonly called the huhu) from decayed wood as a woodpecker does, the female’s was long and curved gracefully downward, enabling her to secure grubs from deep woody crevices that her mate’s short beak could not reach. Never the most common of birds, the huia inhabited beech and podocarp forests, and was apparently confined to North Island’s Ruahine, Tararua, Rimutaka, and Kaimanawa mountain ranges, with occasional reports from the Wairarapa Valley too. (Supposed sightings of huias from the woody country near Massacre Bay in South Island’s Province of Nelson were never substantiated.) Yet although it had been hunted for generations by the Maoris, who greatly prized its attractive tail feathers for their chiefs’ head-dresses, its numbers seemingly did not suffer unduly until the coming of the Europeans. 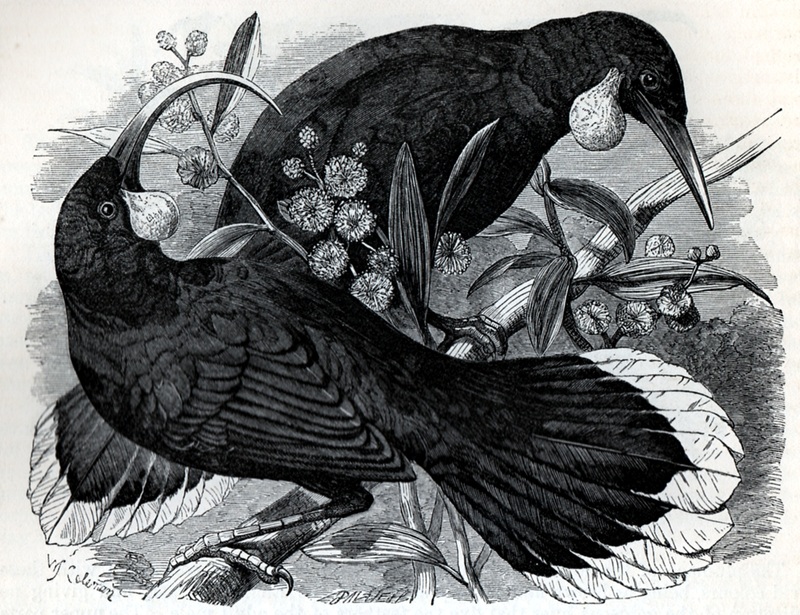 Their arrival, however, was accompanied by all manner of serious threats to the huia’s survival. 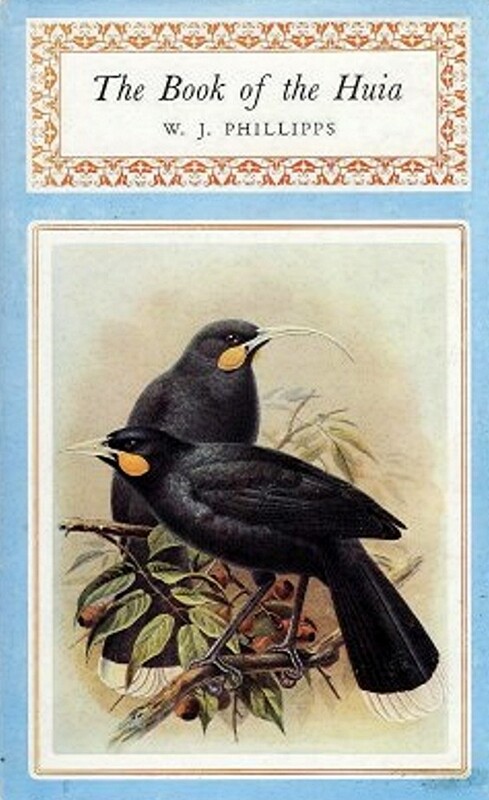 These included: the accompanying introduction of Western species that endangered the huia by preying upon it, competing with it for food, and exposing it to various diseases hitherto unknown there; large-scale procurement of huia specimens for museums and private collections; destruction of its forest homelands for cultivation and grazing; and ultimately the widespread wearing of huia plumes by all Maoris (regardless of status) and by members of European high society. There could be only one outcome. The last fully verified sighting of this species was made on 28 December 1907, when W.W. Smith spotted two males and a female. Since then, the huia has been officially categorised as extinct – but is it? We’ll return to this tantalizing subject a little later. It is not widely known that the familiar glossy-black huia with a white-banded tail is not the only variety of huia on record. For instance, several beautiful albinistic specimens are preserved in various museums, their snowy plumage and pale wattles rendering them almost as a photographic negative of their typical ebony-plumed counterparts. 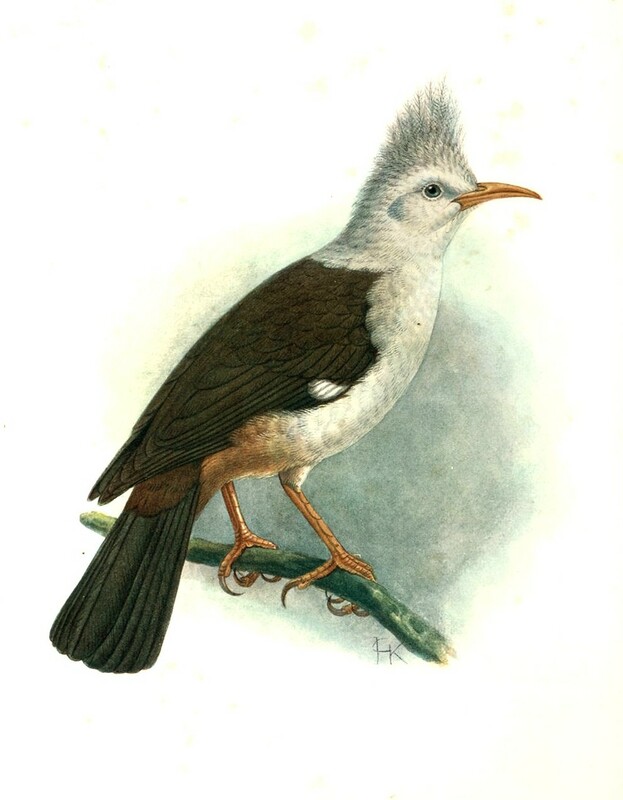 One such specimen, an adult female, was painted in the company of a pair of normal adult huias by celebrated bird artist Johannes G. Keulemans. This beautiful water colour was published in c.1900. It is well documented that immature huias sometimes exhibited a rufous tinge to their tail’s white band. However, Maoris sometimes specifically referred to a ‘red-tailed huia’ in the adult state too, by which they may have been alluding to specimens retaining this rufous tinge of the white tail band into maturity. The skin was afterwards sent to me, for examination, and was exhibited at a Meeting of the Wellington Philosophical Society. It is that of a male bird of the first-year. The whole of the body-plumage is brownish black, obscurely banded or transversely rayed with grey; on the head and neck the plumage is darker, shading into the normal glossy black on the forehead, face, and throat. The tail-feathers are very prettily marked: with the exception of the middle one, which is of the normal character in its apical portion, they are blackish brown, irregularly barred and fasciated with different shades of grey, and with a terminal band of white; the under tail-coverts, also, are largely tipped with white, indicating adolescence. I have on file a number of examples of freak brown specimens belonging to species whose plumage is normally black, such as crows and certain other corvids. 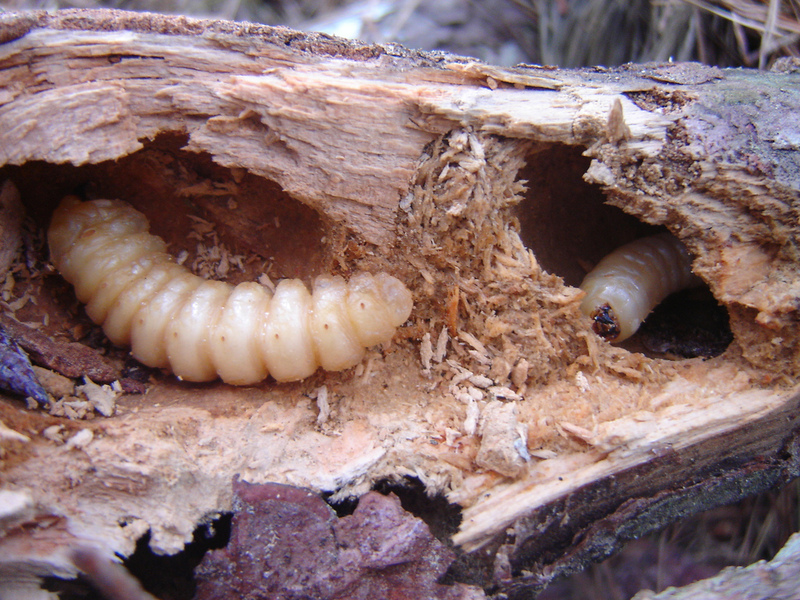 And in some cases, these brown specimens also exhibit a degree of banding or fasciation. 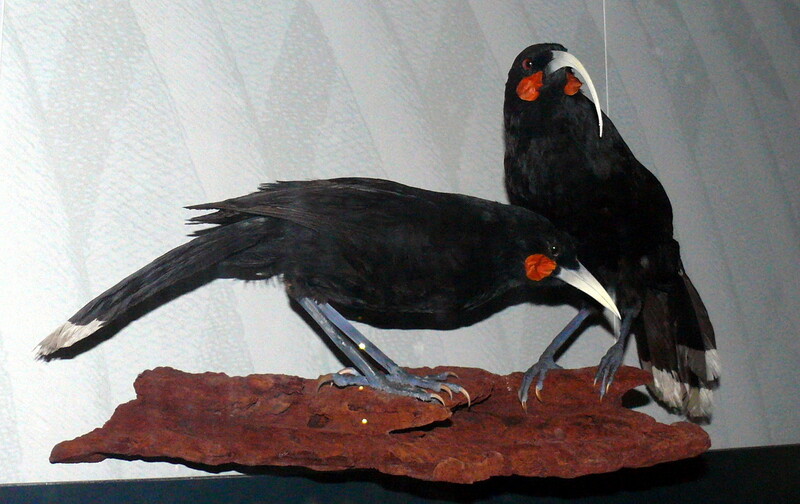 This aberrant colouration and patterning was genetically induced in those birds, so presumably the huia-ariki arose from the expression of an analogous – or even homologous – mutant allele in the huia. However, the softer, longer nature of the feathers themselves in the huia-ariki suggests that another mutant allele may also have been involved, unless there was a single, pleiotropic (i.e. multi-potent) allele responsible, affecting separate aspects of this variant’s phenotype. I wonder if there is an illustration of the huia-ariki? It would be fascinating to see what this remarkable form looked like, rather than having to rely only upon a verbal description. 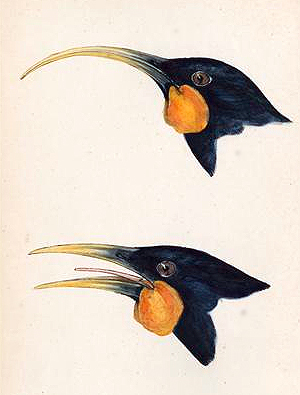 Also on record are a few huia specimens with distorted beaks, such as the bizarre example illustrated above. POST-1907 SURVIVAL OF THE HUIA? The huia’s morphology is unique. No other bird in New Zealand, whether native or introduced, can be readily confused with it – which is why the sizeable number of alleged post-1907 huia sightings has attracted notable scientific interest. Their most detailed documentation is presented in William I. Phillipps’s The Book of the Huia (1963). 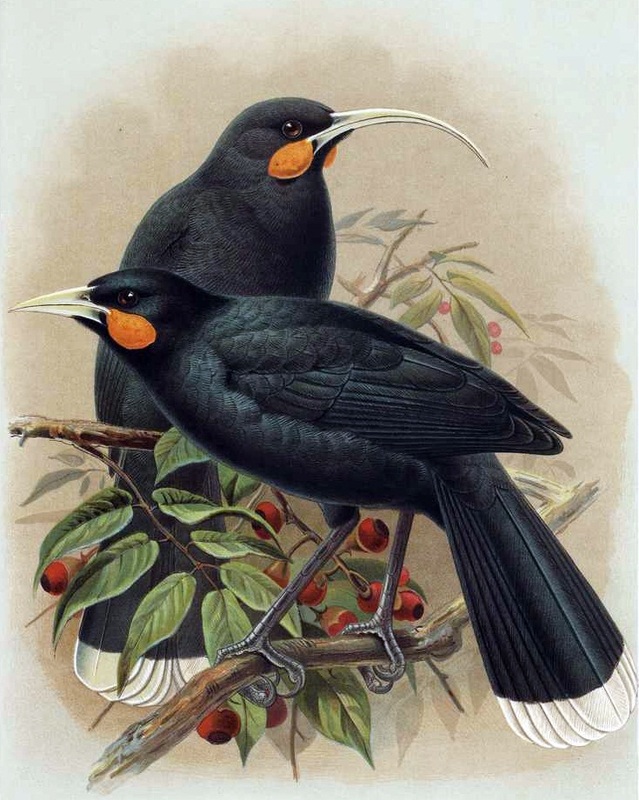 A noted expert on New Zealand’s avifauna, Phillipps listed 23 such sightings, and learnt that as recently as the 1920s eyewitness reports of black birds with orange wattles and white-tipped tails regularly emerged from the huia’s former haunts. Although none were by professional ornithologists, a number of these sightings are sufficiently convincing to give cautious cause for optimism that this unmistakeable species still survived at that time. An official huia search was carried out in 1924, and although no huia were seen, signs of this species’ existence were observed. Moreover, a much more recent event, one that greatly impressed Phillipps, occurred on 12 October 1961, featuring Margaret Hutchinson. As I learnt from Ron Scarlett of South Island’s Canterbury Museum, when Hutchinson arrived for a six-month stay in New Zealand in 1961 she visited the museum first of all, before travelling on to North Island; she interviewed at length its then Assistant Director, Graham Turbott, regarding the huia, as she seemed most interested in this species. After reaching North Island, she spent October at the Lake House Hotel, Waikaremoana, in the Urewera State Forest, where she was studying the native bush (forest). On 12 October, Hutchinson spent the day at a smaller lake called Waikareiti, three miles further on from her hotel, and set amidst New Zealand beech woodland. She had been sitting by the track leading to the lake, watching some large, red-and-green native parrots called kakas pecking dead wood off a tree, when suddenly, as she was looking across a small valley nearby, she saw a bird fly up the middle of it, and disappear into some beeches. It was of similar size to the kaka (17-19 in) but was of slighter build, and its plumage was black, except for the white-banded tip of its tail. 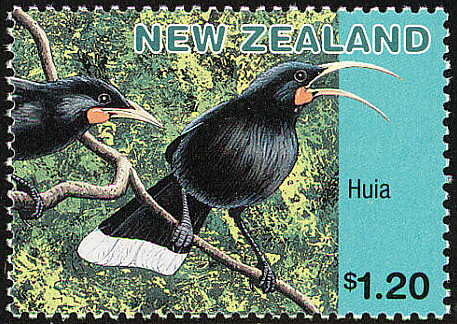 In the field-guide that she later consulted, the picture most closely matching her bird was the huia’s. As she noted in an article published in the RSPB’s Birds magazine (September-October 1970), Hutchinson recounted her sighting not only to William Phillipps but also to Dr R.A. Falla (then Director of Wellington’s Dominion Museum), another major authority on New Zealand birds. 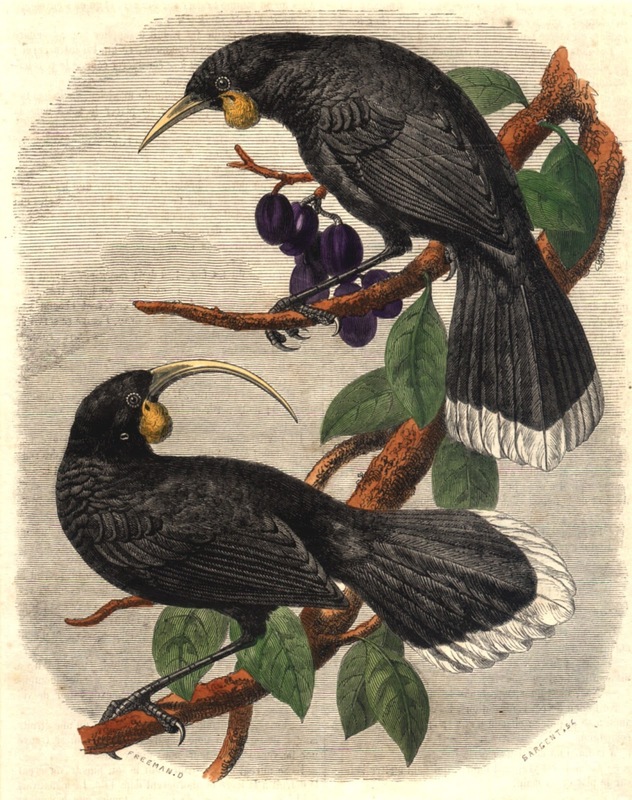 Both men were sufficiently impressed to deem it likely that she had genuinely seen a huia; in The Book of the Huia, Phillipps goes so far as to conclude: “…there appears to be little doubt she did see a huia”. More recently, in 1991, Copenhagen University zoologist Lars Thomas, who has a longstanding interest in cryptozoology, also claimed to have seen a huia, while visiting North Island’s Pureora Forest. Yet if the huia really does still survive, why has it not been formally rediscovered by now? In a foreword to Phillipps’s book, Falla noted that even at best, New Zealand’s bush is not overly conducive to easy birdwatching, requiring such a sustained effort to explore the multitude of potential hideaways for birds that there is rarely enough time to carry out detailed observations at any one given spot, so that all-too-many of its birds are not sighted at all. Having spent quite some time birdwatching in New Zealand during 2006, I can certainly vouch for this. If the huia is alive, it has probably retreated into areas that even by the bush’s standards are quite inaccessible, and thus less readily disturbed. Indeed, over the years a number of people have informed Ron Scarlett of possible huia sightings in the remoter regions of the Kaimanawa range, so that he deems it possible that the species still survives here. 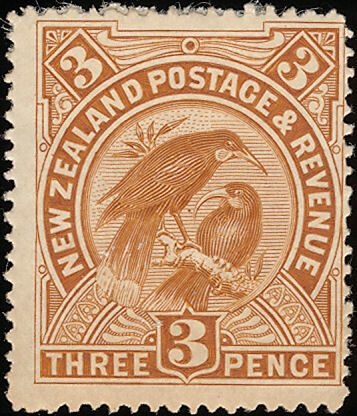 Moreover, as Hutchinson revealed in her article, careful analysis of the post-1907 reports documented by Phillipps do seem to indicate a movement northwards — away from the huia’s most favoured former provenance, the Tarawera Range (now divided up by agricultural cultivation), and into a wilder, mountainous forest region (much less accessible to humans), perhaps as far as the Urewera State Forest after all. 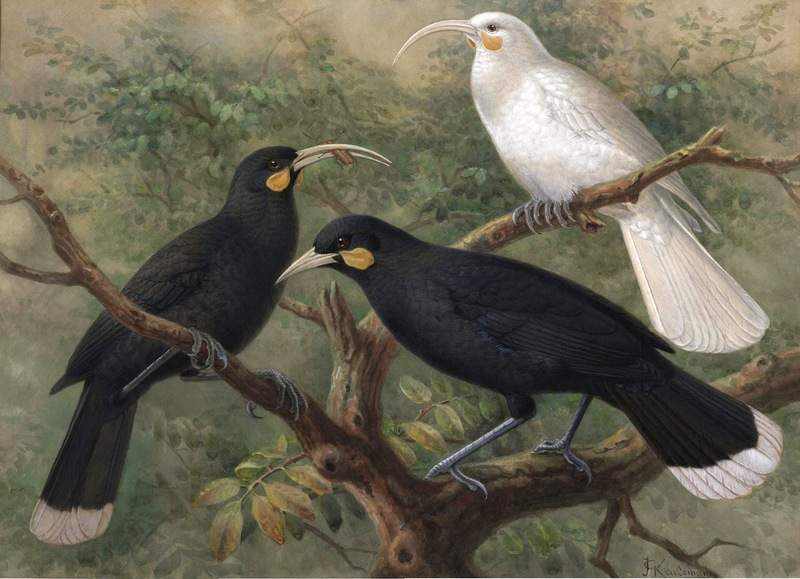 Equally, Ron Scarlett has identified subfossil huia bones from moa-hunter middens on the Taranaki coast, and from limestone caves in the Mahoenui area, lying on the border of North Taranaki and South Auckland, and much further north than the huia’s known modern-day distribution. Could this region’s more remote portions be another putative retreat of surviving huias? Perhaps some huias took refuge in certain northern areas less readily reached by humans during their species’ last stand in its favoured territory. 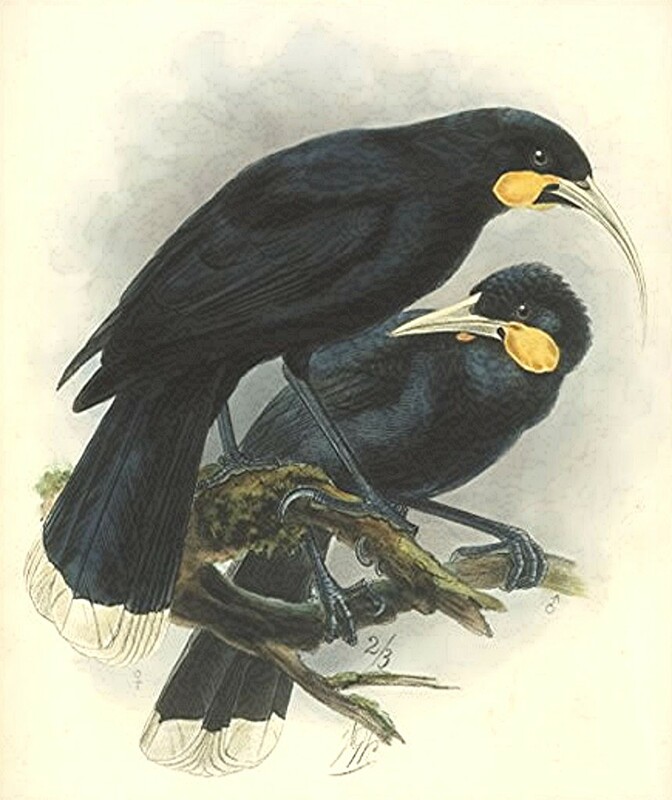 In addition, there might be areas that have always housed a resident huia population, wholly unknown to the Europeans, so that this truly unique species – New Zealand’s handsome and quite astonishing bird with two beaks – still survives after all. RESURRECTING THE HUIA? SEND IN THE CLONES! The extraordinary ingenuity of practical techniques employed in the field of molecular biology may eventually render superfluous searches in the field for officially extinct species in the hope of rediscovering them. Some scientists are already anticipating a time when extinct species may be resurrected in the laboratory instead – by cloning, using DNA extracted from preserved tissues. Indeed, the huia is one ‘classic’ extinct bird that may well become the focus of just such an attempt in the not-too-distant future. In July 1999, a conference attended by biologists, bioethicists, and Maori representatives was held in New Zealand to discuss the exciting possibility of reviving the huia by cloning, using DNA samples retained in museums’ taxiderm specimens. Cyberuni, a firm based in New Zealand and California, is offering to help fund the project if suitable DNA samples can be found. Even so, some researchers have objected to the plan, claiming that the huia’s extinction was a natural process demonstrating its unviability as a species. In reality, however, a major part of this bird’s decline was due to over-hunting for its prized tail plumes, to diseases carried by non-native species introduced to New Zealand by Europeans, and to stuffed specimens being too zealously sought by museums and private collectors. Consequently, if the huia could be restored, humanity would merely be redressing the balance.